Over the years, my wife and I have logged thousands of road miles with our children. With seven kids, we’ve always been open to anything that made travel easier and more enjoyable. Now, most of our travel is with grandchildren, and luckily travel technology is providing us with a steady stream of new innovations. Two great new products came in last month and are worth considering for the children in your life. Being a guy, one of the things I never enjoyed dragging along on a trip to the state fair was a whopping big diaper bag. Unfortunately, we just about always seemed to have one child in diapers, and if you were spending a whole day away, you needed a big bag to handle all those diapers. Fast forward to 2011 and thanks to technology, that can be a thing of the past. DiaperBuds somehow managed to shrink the size of their premium diapers by 70%. Before you get the wrong idea, no, that doesn’t mean they make bikini diapers. I mean they vacuum pack a standard size diaper, expelling most of the air, so that their package is smaller than the palm of your hand. Open the pack and the diaper unfolds and fluffs up to perfectly normal size. Taking up less space is only half the story though. By having each diaper shrink wrapped, they are kept perfectly clean and dry before use. If that sippy cup spills in your bag, at least the diapers will still be dry and clean when you need them. Sometime a photo is worth a thousand words, so watch this 21 second video. Right now, sample diapers are available very reasonably on their website so you can try before you buy a big box. 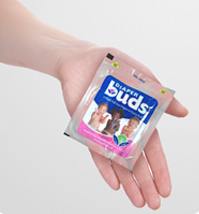 Want to feel even better about trying them…DiaperBuds has chosen to donate to 'Heather on Earth Music Foundation', a nationwide organization whose goal is to provide music therapy to children who are ill (heatheronearth.org). 100% of the donations made to Heather on Earth are spent establishing music therapy programs in hospitals for the benefit of the children. DiaperBuds will make an annual donation to this charity. DiaperBuds are available on their website as well as diapers.com and Amazon.com. So, besides keeping the child dry, keeping the child fed is the other challenge while traveling. 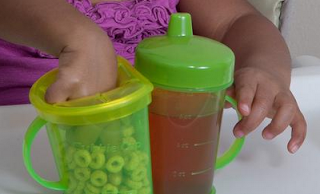 Once the child outgrows the bottle, the sippy cup and the snack bowl naturally follow. Problem is, most children at age two don’t do well holding both. Use one – throw the other on the floor. Once he (she) realizes they want the other – it’s now on the floor. Whaaaaa! Once again, technology and American innovation have come to your rescue in the form of the Cubbie Cup. Parent and CEO Tiara Henderson experienced the above situation once too many times, and set off to do something about it. Her innovation is a simple welding of cup and bowl into one unit. Now with one grip, you child is holding both cup and bowl (with spill-resistant top) in one device. With everything there in one piece, there’s no need for your child to set down ( or throw ) either their drink or their snack. So, whether your child is in your car, a plane or just taking a stroll in the stroller, chances are that your life is going to be a bit easier. To get the picture, here’s an even shorter 14 second video. The Cubbie Cup is dishwasher safe ( Yea!) and is BPA and PVC free so it’s nice and healthy for your child. You can order the cups online at their website.